Today our modern lifestyle is characterized by striving to the highest productivity, effectiveness and fast tempos. We are always in a hurry as if constantly being under pressure. Thus, our lives are teeming with rapid emails, shortest time spans, most favorable and lucrative opportunities, fast food and so on. In other words, we tend to save as much of our energy resources as possible. The solution for such a peculiar issue already exists – on-demand services applications do really help people to manage their day in the most appropriate way. It’s more than likely that you have already used some on-demand service application as, for example, Uber’s taxi, e-commerce, health and beauty services, housekeeping, food and parcel delivery or any other app, and understand the great thing how it truly simplifies our life. So, today applications have a great influence on the personal and professional lives of people. Almost all the industries have their mobility solutions – the App Store and Play Market are awash with the apps for everything. There is no any necessity to prove that Uber is one of the most successful enterprises and a lot of young companies strive to replicate their success – in 2017 Uber customer number reached 40 million per month and by May of this year Uber’s share of the United States ride-hailing market was 77%. 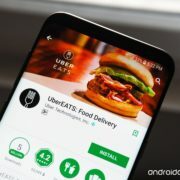 While there is no fitting rival for Uber on the market yet, on the contrary, the popularity of on-demand food delivery services area continues growing at an unbelievable pace, which leads to the growing demand for food delivery applications and, consequently, to the competition between them. DoorDash, GrubHub, UberEats, Deliveroo, Postmates have already carved out their niche and hit the big time now. For example, GrubHub is a leading online food ordering company that was launched in 2004, and it still remains the best food ordering platform with a broad selection of over 70.000 restaurants, vast client database and a market capitalization of more than $2bn. GrubHub allows users to choose local restaurants and to pick order food depending on cuisine and clients` reviews. The app provides an automatic search of surrounding restaurants, saved order history service, simple navigation, real-time delivery information and many other useful features that helped to win authority among competitors. So, it is no wonder that GrubHub keeps track of 2,40,000 orders daily and has more than 6.70M users. 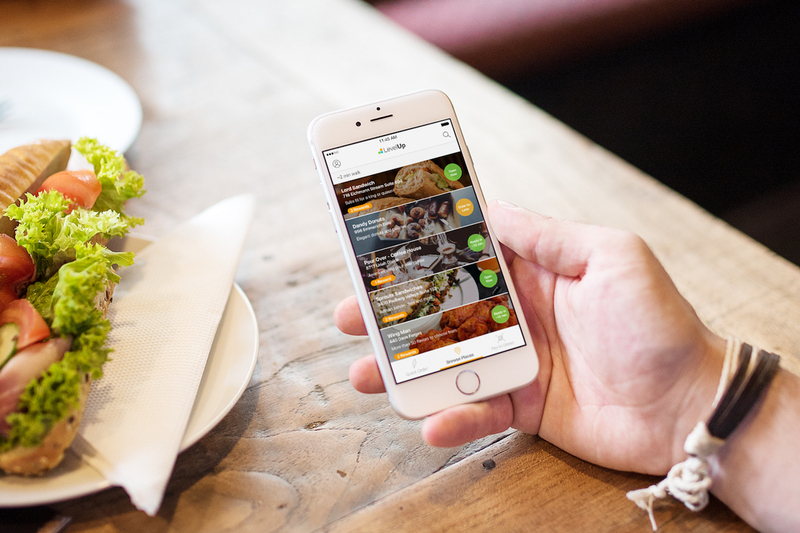 Technavio says that the global online on-demand food delivery services market will be up by 32 percent by 2021. Being the most demanding users of on-demand services, millennials continue popularization of the industry making it more than just a buzz. What is more, seniors also make their contribution in this process – they adopt smartphones more and more as they find mobile apps the best solution to simplify any process. The “one-touch-and-you’re-in” accessibility of today`s applications is a great tool for those with aging hands and eyes. Thus, food delivery startups increasingly gain the attention of potential users and strive to conquer the overcrowded market. It is real to become one of those leaders we have mentioned before – at least you need to observe all the necessary rules, principals and features which popular platforms already have. The key to success is to combine them with your unique approach that will surely lure your users. Restaurant that receives that order, prepares the meal for delivering it to the customer. They get paid for each order from the aggregator. Delivery agent (independent or hired by the restaurant) receives the order through a special application, takes the parcel from the restaurant and deliver it to the customer. Platform owner that performs a balanced system of all the members’ cooperation. The “owner” gets the commission for each order from the restaurant, charges from customers, subscriptions and different sponsored ads. Let’s get deep in details. The first thing people draw attention to is a beautiful interface that allures them with its appearance and simple navigation. Users appreciate well-structured applications and websites where every needed button is seen at a glance. This applies to the sign-in page as well. Customers can start using your services after entering some personal info as name, email id, password, phone number and other details. All that helps you to stay in constant communication with users – you may track the story of their “traveling” on the platform, see preferable and most common requests, and then make them special personal offers. The fewer steps a user meets on the road to making an order, the better. Let them enter personal account only through username and password – we have already mentioned that we always strive to save our time and diminish efforts while implementing some processes. You can also add some specific questions about their favorite dishes, cuisine and restaurants in the form, which will then make their searching for meals faster. Menu card of each restaurant needs to contain a categorized list of food with names, detailed description, images and prices. Here the principle “the more – the better” works as well – the main is not to overload with the information. Simplify the process of searching by adding more detailed categories as cuisine (Japanese or Asian cuisine) and the type of meal. Reviews and ratings on customer dashboard can also help people with making a decision in case they don’t know exactly what they want to eat, and, in general, if the chosen restaurant really worthy. Another one extra feature that is really appreciated is providing customers with the possibility to compose the dish almost by themselves. For example, if a user wants to order pizza, let him decide what ingredients to add and which of them to remove just by tapping on a plus or minus – if he likes cheese, let him order double cheese for extra money. The best way for that is to make it in the form of a submenu. A great idea would be to add special timing menus as, for example, a menu for breakfast, lunch and dinner. Don’t forget about the vegetarian list and special dishes list for those who keep dietetic nutrition. Once a customer decided on what to order, the checkout process takes place. Users need to see the list of meals they chose and all the necessary additional info before making payment. The important here is to provide the possibility to change the order on the same very stage without the necessity to go back to previous pages and redo all the process – just delete the dish or triplicate that double cheese with one sweep. Here you can also add some info about actual discounts and, what is more, lure by special discount coupons which will surely make users chose you next time. When the bill is generated it would be convenient to know the time of delivery and to track the order’s traveling in online mode. The usage of the GPS technology became an extremely popular tool due to which people hesitate less when choosing a restaurant. Remember that people must be provided with as many ways of payment as possible – give them a free hand. Those options may include PayPal, credit and debit card, net banking, Apple and Google Wallet, and of course Cash on Delivery option. It is important to understand that being in constant contact with the client increases your chances to become number one restaurant to choose. That is why online chats and email support is so vital – they will never leave the buying process if you are online and provide help at the right time. Next step is to think over an appropriate development of the owner dashboard. Let’s start from the login procedure. Usually, the owner logins with his personal account where he can see the list of past and latest orders and manage them as well. We have already mentioned that the structure of a menu list of the restaurant must be well organized. The same concerns the restaurant owner dashboard. All the information, images and descriptions are necessary to fit food items, they must be relevant and actual. The catalogue is to have the possibility to be updated with the latest changes in cuisine, appropriate dishes and so on. It is important to screen the orders and check all the accompanying information about the ordered food after which delivery agent gets order details and delivery address. Customer should also be apprised about delivery time. What is more, the dashboard must include the part where you can keep a structured record about all the additional expenses as payment for delivery service, different refunds and so on. Your food delivery app will surely succeed if it gathers the restaurants that are successful by themselves as separate units. To being be up to the mark and even better the owner must check all the reviews and ratings of cuisines, separate dishes, delivery service and so on regularly. Another one useful and highly necessary service of any on-demand applications is push notification – it plays a great role in providing customers with ‘immediate satisfaction’. Those pops up on the smartphones with time delivery, chose the method of payment and other details of the order make people feel calmly and confident. These brief, powerful messages can also be sent in case menu list is updated or restaurant provides some special offers and discounts. Control Panel is represented as a platform from where the admin performs the control over all the operations of the online food delivery service. Admin can also decide on which restaurant to set a partnership with, and which can be added to those ones already existed on the platform or removed (and even blocked) in case restaurant has bad customer reviews. Such decisions can be made about delivery agents as well. Admin must also have an additional dashboard for controlling payments receiving from orders and additional sources. The User Interface and User Experience are one of the most important aspects of the on-demand food delivery app because it is the first what people notice when commencing the usage of your app. Users appreciate not overloaded interfaces with beautiful images which is extremely important especially for food app. Thus, you can even easier lure clients than the apps from other industries – people tend to fall for beautiful images of food, and this visual hunger provokes changes in the organism so that the desire of meal increases the traffic generation to your app. Sounds funny but it `s a proved practice. Nevertheless, the beautiful interface works only coupled with well-structured content. Today, blockchain technology has a great impact on marketplaces providing new opportunities and changing the way of making transactions online. You probably already know that blockchain is represented as a decentralized ledger that records, verifies, and tracks cryptocurrency transactions and contracts between parties. Blockchain-based marketplaces are peer-to-peer networks that directly connect producers, consumers and sellers without any intermediaries. Generally, they operate the same way as traditional marketplaces: producers provide information about their products, sellers also offer product information and content about their goods, consumers search for these products and make purchases. A blockchain-based marketplace is hosted by its users and supported by their computing power, which means that a marketplace is always accessible. Data hosting becomes more security, privacy, and transparency. With blockchain technology marketplaces avoid hosting costs altogether and set the lowest possible prices for producers, sellers, and consumers. Each seller plays his own rules – they specify their own terms, provide special offers and opportunities, share the information about their products in their most preferable way. Blockchain marketplaces is characterized by lower fees to producers and sellers, that also means lower prices for consumers. By the way, each payment is transacted directly between the consumer and the producer or seller. By using digital currency, producers and sellers don’t need to trust anybody with taking payments on their behalf, as payments are transacted directly between the consumer and the producer or seller. As for sellers & consumers interaction, producers don’t have to pay for placing their products on the marketplace. They pay only when a product is purchased. Sellers can offer any products they wish and promote them in any way they like, getting commissions for each sale. Customers can choose the products they want at the price that’s most attractive to them. Blockchain marketplaces provide transparency for transactions and agreements. Additionally, producers and sellers are offered a digital IDs to verify and track their products and businesses. Smart contracts is another one reliable and unbreakable integrant of the blockchain-based marketplace that removes third parties and guarantees trusted transactions. As you see, blockchain-based marketplace removes intermediaries, all transactions are traceable on a public ledger, demonstrating a high level of security and transparency. This is a really big deal if you our business manages a marketplace. Summing up it is worth to say that the development of on-demand food application is a great chance to become one of those mobile app market giants. The key to success is to analyze that market and become better on that base. Our team can share the unique expertise and best e-commerce marketplace solutions. If you feel it is a high time to develop your own on-demand food delivery application one, feel free to contact us. Nearly every eCommerce platform today comes with a selection of free and premium themes, allowing you to quickly apply a design to your website. You can often apply customizations to them yourself, although this isn’t always easy beyond simple things like background images and colors. Still, with a little work, many online store owners have no problems using a pre-existing theme. However, you might decide none of the available themes are right for you. Maybe your platform only offers themes that use outdated design conventions, or maybe they all look very similar. Or maybe you’ve used a theme for a while, but you feel your brand is ready to solidify its look through a unique design. Or, perhaps, you can’t find anything you feel truly represents your brand and the image you’d like for it to project. The solution in all these cases is a custom design. Your needs can fall closer to the technical end of the spectrum, too. You might need a specific functionality that isn’t already available in your eCommerce platform’s built-in integrations or app store. These needs can vary significantly — you might need your company’s proprietary software to work with your eCommerce website, or you could need something comparatively simple. In this case, you’ll need a developer with knowledge of how to build the features you’re seeking. In many cases, design and development need to come together to create the best results. Whether you need a new look for your website or an expansion of its integrations and capabilities, here are some things to keep in mind as you look for a designer or developer. This should be the first qualification you look for: you need someone who understands the intricacies of the eCommerce platform your website runs on. While many eCommerce platforms utilize common coding languages, others have much more specific requirements. Always ensure the developer you’re evaluating has the knowledge and experience to work with the software you use. Any experienced developer or designer has an online portfolio of completed projects. These usually include screenshots and links to websites they’ve previously worked on. Spend some time visiting the sites in the portfolio and click as many links as you can. Look for problems like broken links, error messages, and potentially-unanticipated design flaws. It’s up to you to judge the quality of the work, but any obvious issues are cause to find someone else to work with. The best developers are interested in full communication with you to make sure they’re accurately understanding your needs and can produce what you want. They listen to your requirements, make suggestions, explain timeframes, and maintain communication throughout the process. Look for a someone who can form a solid relationship with you as you work together. If they have a project flow on their website, in which every step of the process is explained, this is a good sign. Most design and development is priced by quote, which is arrived at through discussion of the work you need to be done. If you have a hard time understanding what’s included in the price — amount of work, number of revisions, etc. — ask for clarification. If the developer seems to have trouble arriving at a specific amount of work for a specific price, this is often a sign of inexperience or sloppy business practices, and chances are, you won’t feel as if you got what you paid for. It’s important to have a budget for web design since this is an important cost to consider when building an online store. If you’re considering working with someone for just about any project, learning from their previous customers is always helpful. Look for reviews and testimonials, not just on the developer’s own website, but elsewhere. Search for their business name on Google or another search engine and read all the customer feedback you can find. You won’t find as much information on smaller or newer companies, but you may run across valuable information that can help you decide whether or not to use them. There’s a wide world of eCommerce developers and designers out there, and choosing can be difficult. It’s easier, though, when you know what to watch out for — both good signs and bad. Keep a list of individuals and firms you’re interested in and eliminate the ones who raise red flags during any point of your evaluation process. By doing this, you’ll be able to narrow the field until you find the right one to work with: someone who understands what you need and has the ability to create it to your satisfaction at a fair price.